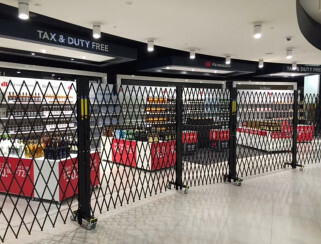 These retractable barriers and expandable barriers are widely used to secure temporary tenancies, kiosks, pop-up shops, mall walkways, construction areas, entertainment venues and events, and other areas needing a versatile, cost-effective, short-term security and barrier solution. The Australian Trellis Door Co offers a broad range of retractable and expandable barriers and technical support services. We provide onsite installation, barrier design, and a full selection of barriers for all types of retail, commercial and industrial premises. We also offer a range of combination services for your premises, including security doors, roller shutters, DIY options and more. Our range of retractable barriers and expandable barriers includes mobile trackless barriers for internal security needs, ideal for flexible onsite requirements. These barriers may be deployed in any environment and are designed for enclosing any type of space in multiple configurations. The Australian Trellis Door Co’s products and services are available across Australia. Contact your local ATDC centre for all the services you need for barriers and other security products. For more information about our retractable barriers and expandable barriers, contact us online or simply call your local ATDC centre. We’re happy to provide any services, support, or practical advice you need.